For today’s review, I decided to review a rather interesting tea. This tea is a GABA processed oolong from Taiwan. The GABA processing for teas was discovered in Japan in the late 1980’s. 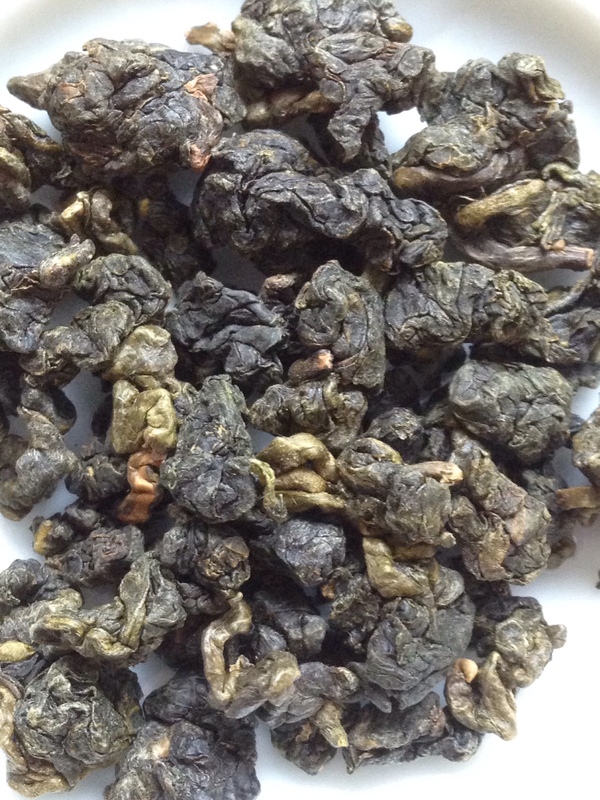 You can find GABA black and green teas, but most are oolong teas. I’m not sure why that is, especially since green tea is so much more popular in Japan. Perhaps somebody out there has the answer to this dilemma, and can tell us in the comments! If you’ve ever taken an Intro to Psychology or Neuroscience course in college, you are probably familiar with GABA. Gamma-Aminobutyric Acid is one of the main neurotransmitters for the Central Nervous System (CNS). Its most important role is to reduce neuron excitability. Thus, GABA supplements are most commonly associated with their calming effect on the nervous system. These teas are usually advertised for their ability to improve relaxation and sleep quality, lower blood pressure, and lower cholesterol levels. Some students in Japan will use GABA teas to improve their performance on exams. While searching through vast online articles about obscure teas, I even found some articles suggesting that GABA teas can help fight off schizophrenia. As with most excessive health claims, these are probably only true to a certain extent…or not true at all, in my opinion! But if you enjoy this tea anyways, I suppose that is a pleasant potential side effect. Although this seems like a bit of a silly marketing scam (because it probably is…) many tea bloggers and tea aficionados in the world really enjoy GABA teas due to their unique taste. The GABA process for tea is quite simple. You just have to expose the tea leaves to extremely elevated levels of nitrogen during processing. During the oxidation phase of processing, all of the oxygen is replaced with nitrogen. This causes the glutamic acid in the tea leaves to be converted to GABA. In order to be considered a true GABA tea, the leaves must contain at least 150 mg of GABA per 100 g of leaf. Most of the GABA teas I found online claim to have between 200 and 300 mg per 100 g of leaf. GABA teas are quite popular in Japan, but are just making their way to the States, so I feel pretty lucky to get the chance to try such a unique beverage. Thanks, Japan! You never fail to disappoint me with your quirky inventions. Anyways, on to the exciting part! 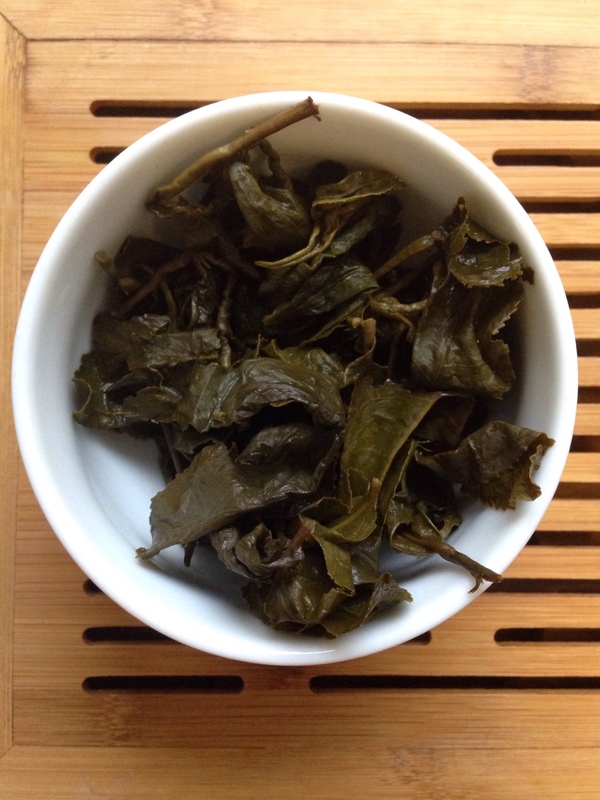 The dry leaf of this tea looks pretty similar to your standard rolled style oolong. The leaves look pretty high quality, are there is no dust or broken leaves. The aroma of this tea is so unique. I have never smelled a tea like this. Like other tea bloggers I’ve read, I really have no words to describe what this smells like. While some people on Steepster and other tea snob enthusiast sites do not like the smell, I actually really enjoy it. It seems kind of bread-like. 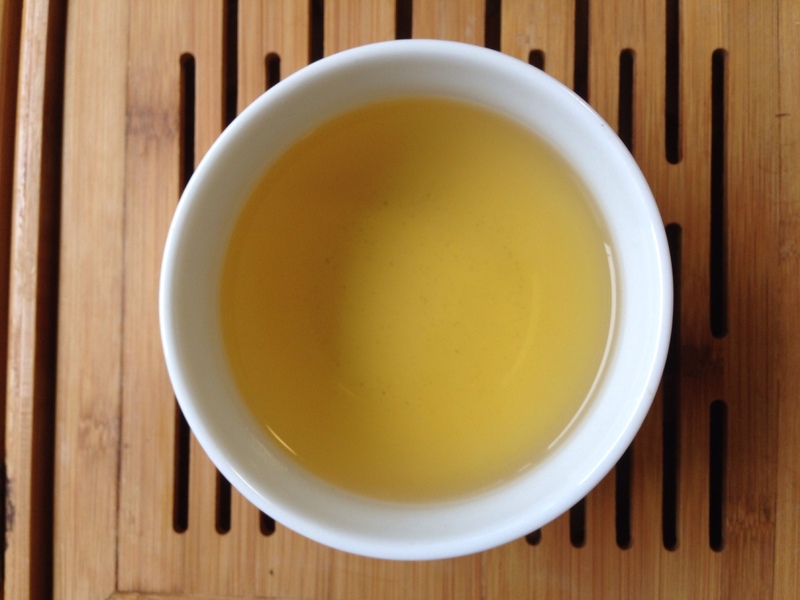 It’s very yeasty and roasted smelling, kind of similar to a roasted oolong but with a bit of a….sharpness to it. Very intriguing! Oh, you want to see a more up-close shot of the action? Sure! I brewed five grams of the leaves in my tea tasting set. Brewing this tea was an experience in itself. I gave the leaves a quick five second rinse. When I poured the boiling water over the leaves in the first steep, a ton of bubbles came rushing to the surface. This effect lasted several seconds. Presumably this has something to do with the GABA process. Neat! My first impression of the taste is…wow, this is really weird! 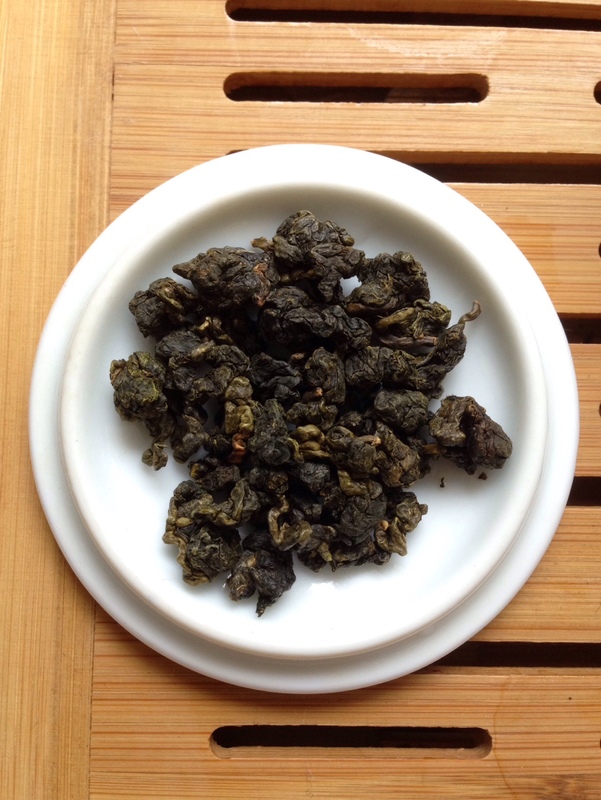 The taste is very roasted, like a typical roasted oolong. But the yeasty bread like smell comes through in the taste as well. It’s very odd, but pretty pleasant in my opinion. This tea is also quite fruity. It has a dried fruit/raisin sort of taste, similar to the Medium Roast TieGuanYin from Mountain Tea that I reviewed last week. There is a very notable sour taste to this tea, which many other reviewers have noted. I don’t find this unpleasant, but I don’t think I would necessarily want to drink this regularly. The first and second steep had a strong woody taste to it, but this faded away in the third and fourth steeps. The later steeps became more floral and light. These later steeps were very pleasant, so I would say that this tea holds up very well to multiple infusions. The leaves unfurled very nicely. Most of the leaves were attached in groups of threes or fours. This looks very high quality! None of the leaves were torn or bruised. There were a lot more stems than oolongs usually have. This tea is very interesting and strange, but I really enjoyed it. This is definitely a tea worth trying. At $11 for 2 ounces or $23 for 5 ounces, it’s not too expensive either. I would be interested in trying some more GABA oolongs in the future so that I could compare them. I’ll definitely be enjoying the rest of this bag.